My husband woke me up right before 4 am to look at a weird, bright star he had noticed the other night. It looks like a planet. We went out back and I saw what I thought was a shooting star out of the corner of my eye and that’s what first caught my attention. I looked to the north and saw a blinking light. I thought it was an airplane at first. It was hovering though and the lights were blinking fast, and it darted to the side real fast, not very far, and then darted back again. It did this a few times and the lights were green, blue, red, orange, and white. 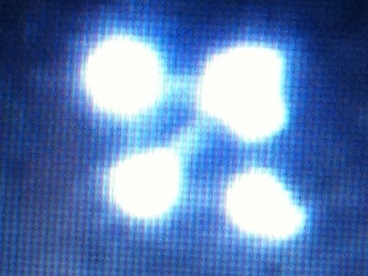 UFO Sightings | Joliet Illinois | October 18, 2011 | 1 Witnesses | Blimp Shape | Had Lights | Glowed | DirecTV Blimp? United States Comments Off on UFO Sightings | Joliet Illinois | October 18, 2011 | 1 Witnesses | Blimp Shape | Had Lights | Glowed | DirecTV Blimp? Editors Notes: From what we have read on the internet, this reporting seems to be a DirecTV Blimp. More info on this below the report. Event Description: Joliet Illinois last night on October 18 2011 at about 8:00 pm I was driving south down Larkin Ave after doing some grocery shopping. I noticed something in the sky that at first looked like the moon trying to come through the clouds. Kind of a domed shape shining behind the clouds. As I kept driving I noticed this thing was actually moving. I got out my phone and started recording this thing. I was driving home to Joliet on I-355 from Chicago about a mile north from the ramp for I-55 South I noticed a red glowing laser like orb up ahead that I thought may be on a tower but as I got closer it was hovering directly over my lane on the expressway about maybe 50 feet in the air and as I passed it I had to hang my head out the window to look up and get a better look at it but all I saw was a bright red light like that of a laser it was almost hard to look at and appeared as though it was somewhat transparent.